Our Baldric Belt Buckle with Shells measures 4 1/2 inches Wide by 3 1/2 inches high. It is the perfect finishing touch to any Pirate garb. 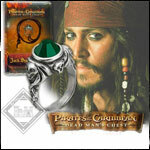 This buckle is based on the design of the buckle on Captain Jack Sparrow (Johnny Depp) from the movie Pirates of the Caribbean. Our Dead Men Adult T-Shirt is from a line of top quality 100% cotton shirts. Hand-dyed and printed in USA. This shirt only comes in this color. Chase the horizon in this Disney Pirates of the Caribbean: Dead Men Tell No Tales Adult Jack Sparrow hat. Made with the captain of the Black Pearl in mind, weathered faux leather construction and crossed stitch detailing on two sides. Our flintlock pistol baldric can hold up to three holsters and pistols. Baldric made of top quality leather in the U.S., pistols are made in Spain. Our Flintlock Pistol Pin is a must have item to complete your pirate ensemble. This Flintlock Pistol Pin measures 3 inches long and 1 1/4 inches high. Our Gov’nah Tricorn Hat has an authentic style of the military tricorns from the 18th century. This piece is a true status symbol. Made of a stiff, black ultra suede material. Sail the Caribbean with this licensed Jack Sparrow headpiece and steer clear of Davy Jones and the Kraken. Scarf ties in back for complete adjustability. Fits adults and kids 8 and up, cotton/polyester. Arrrgh Matey! Sail the high seas with this popular pirate style hat. Featuring a detailed, latex skull and crossbones on the front. Don't have a peg leg? Fake it! These mismatched pirate socks are perfect for completing your piratical look. One striped, one wood grain. One size fits most. Our Hawksley Replica Black Powder Flasks are fully functioning and as good as the originals they are based on. Every detail is captured and only correct original markings are used on each, with no modern marks. Polished bright, they will closely resemble an original antique flask after a period of normal handling causes it to patina. Deluxe Leather Pirate Hat in Black, full-grain quality leather Tricorn Hat. Each of these leather hats is handmade. Detachable sides allow you to create your own look and will keep you in character at your next LARP event. Deluxe Leather Pirate Hat in Brown, full-grain quality leather Tricorn Hat. Each of these leather hats is handmade. Detachable sides allow you to create your own look and will keep you in character at your next LARP event. This Tricorn Hat is inspired by the swashbuckling pirates; it is for those who still live by the "Code". Made of Top grain leather with a weathered, dark brown finish. This versatile full grain leather belt works well with either Pirate / 17th century outfits or with your Renaissance clothing for faire! Our Medieval Cotton Sash is available in many colors. The Pirate Cutlass Letter Opener is an ornamental miniature sized replica of a Pirate Cutlass, 9.5in long, beautifully crafted as a letter opener. The miniature Pirate Cutlass, infamous weapon of these seagoing marauders, is over 9" long, with sheath. Makes an excellent letter opener and a great desk accessory. Our Pirates Leather Sword Baldric with two Knives and Round Buckle not only gives you a classic form for wearing a sword but also two close quarter fighting knives with real polished bone scales that ride firmly in integral scabbards. This Pirate Holster can be worn on any belt (up to 3" wide), or added to our pistol baldrics. A baldric can hold up to three of our holsters! Available in either brown or black leather, hand made in the U.S. The Large Pirate Booty Pouch is a pouch with which to haul the plunder to the treasure chest. Our Piece of Eight Pirate Pendant measures 1 3/8 inches in diameter and comes on a 36 inches long black cotton 2.5 mm cord ready to wear. It is cast from lead free pewter in the USA. Our Pirate Skull and Crossed Swords Pin is loosely based on the the flag used by the pirate Calico Jack. It measures 1.75 inches by 1.75 inches. It is cast in lead free pewter in the USA. It comes with two pins on the back for a very secure attachment. Our Pirate Baldric Buckle is made of solid pewter. The buckle measures 4.25 inches by 3.375 inches. It will work with leather up to 2.0 inches wide. It is a perfect finishing touch to any Pirate garb. Flexible and multi-purpose, this Large Linen Sash is the ideal accessory to polish off any costume or outfit. It is made from linen fabric, making it light and easy to wear. Our Leather Head wrap is made of 100% genuine leather. Our Leather Beret is 100% genuine leather. Made proudly in the USA! Our Leather Boot Garters are an effective way to keep Medieval, Renaissance or Pirate Boots in place. Leather Boot Garters made from top quality heavy duty leather. Sold as a pair. Based on some popular pirate movies - we came up with our Pirate Leather Sword Baldric with Ornate Pewter Buckle. Baldric is slightly distressed (For that well used look seen in movies). Available in many leather colors. Flexible and multi-purpose, this Large Satin Sash can be worn at the waist, around the head, or however you wish. Measures 20 x 100 inches. At a size of 33 x 33 x 52 inches (length of the legs) this Linen Triangle Bandanna allows for a long tail. Perfect for topping off a pirate or gypsy costume, or just keeping your hair out of your face on a hot day. Flexible and multi-purpose, this Large Cotton Canvas Pirate Sash is the ideal accessory to polish off any costume or outfit. It is made from linen fabric, making it light and easy to wear. 12 feet long. Pirate Sword Baldric with Antiqued Brass Buckle. Classic form for wearing a sword and made with sturdy leather for years of use. The Pirates Baldric will fit most types of swords from that time period. One Size Fits Most. The Red Cotton Fringed Sash is a great addition to any Renaissance, Medieval, LARP or Pirate outfit. The Red Cotton Fringed Sash can be used as a waist Sash or around your head. One size fits all. Our Powder Horn is a finished and polished cow horn. The base plug is custom fitted to the natural shape of the horn and secured with brads. Hand carved grooves are cut into the tip of the powder horn, and it includes a leather strap. Comes with a wood stopper in the pouring end. Our Powder Horn in 11 inches, replicating Revolutionary War period pieces, are crafted in genuine cow horn, with hardwood caps and stoppers. Our Powder Horn with Carved Spout, replicating Revolutionary War period pieces, are crafted in genuine cow horn, with hardwood caps and stoppers. Our Satin Sash ties at your waist, or use it as a headwrap. It makes a nice alternative or addition to a belt. Over 100 inches long! Our Pistol Baldric with Blunderbuss is shown with one extra holster attached and a blunderbuss pirate pistol in pewter. Blunderbusses are also available in an antique brass finish. Our Small Pirate Booty Pouch is perfect for carrying your booty, available with a red or black front. Our Solid Pewter Belt Buckle measures 2.75 inches by 3.75 inches high. It will work with leather up to 2.5 inches wide. It is cast from lead free pewter in the USA. Our Solid Pewter Belt Buckle is a perfect finishing touch to any Pirate garb. Our Scroll Pewter Pin measures 3/4 of an inch by 3/4 of an inch in diameter and comes with a standard clutch back. This brooch is the perfect edition to add the finishing touch to a medieval or renaissance garment. Our Skull and Crossbones Pewter Flask 6 Ounces measures 4.33 inches tall by 3.54 inches wide. This Hip Flask is a stylish and well thought of gift, especially for a loved one who seems to have everything. This powder horn is made by Windlass Steelcrafts from real horn with a hand carved end cap and spout plug: no two are alike! Natural leather shoulder strap. Comes with a wood stopper in the pouring end.